When we think about summer we automatically envision bright summer days filled with blooming flowers and lush summer fruits and vegetables. The nights are warm and a crisp chilled bottle of white wine would top it all off right? After all, red wine does equate to wintery nights, cozied up by the fire enjoying a homey meal. Truth be told, there are actually some red wines that are perfect for enjoying in the warmer months. These tend to be lighter in taste, but are still bold enough to pack a punch. A merlot is a light-bodied wine that has a fruit flavor profile and goes well with barbecued meats and roasted meats. Our Milestone Red is aged in Hungarian Oak barrels for 2 years. Now the question is, do you chill your wine? According to tradition, avid wine drinkers and wine lovers by heart, red wine should always be enjoyed warm. In fact, even the way in which you hold your wine glass should be in regard of this to help keep your wine warm. But what about when its 105 degrees outside and you’re craving a chilled drink? Since the summer reds are more on the lighter side of the palate, ideally you should serve it between 15 and 18 degrees. Place the bottle in the fridge for about half an hour before drinking it. This short time period makes a massive difference. Your red of choice should also be low to medium level in tannin as strong tannic wine can be a bit too much for the palate during the summer. A wine that is moderate in alcohol works well since alcohol can affect you more in the hot weather. Now, drinking the wine by itself isn’t the only way to enjoy red wine or wine in general. On a warm summer’s day, you can whip up a yummy sangria. A sangria is a beginner friendly, low hassle and very refreshing cocktail. It consists of wine, fresh fruit and a touch of brandy but this is optional. Since we are using red wine, citrus summer time fruits that you can use are orange slices (navel and blood orange), grapefruit slices, raspberries, strawberries, grapes and even fresh herbs like rosemary. Pour a bottle of your favorite red into a pitcher (our Lemberger is a great fit for a sangria). Add your fresh fruits and or herbs and give it a stir. At this point you can add a splash or two of brandy and sugar if you feel like it. Mix well and let the sangria mix set in the fridge for at least 30 minutes so that the flavors can mix and mingle with each other. Serve this on or off the rocks and your guests will be amazed at how well the flavors work with little to no effort. Now you are able to enjoy your favorite red all year round with these tips. 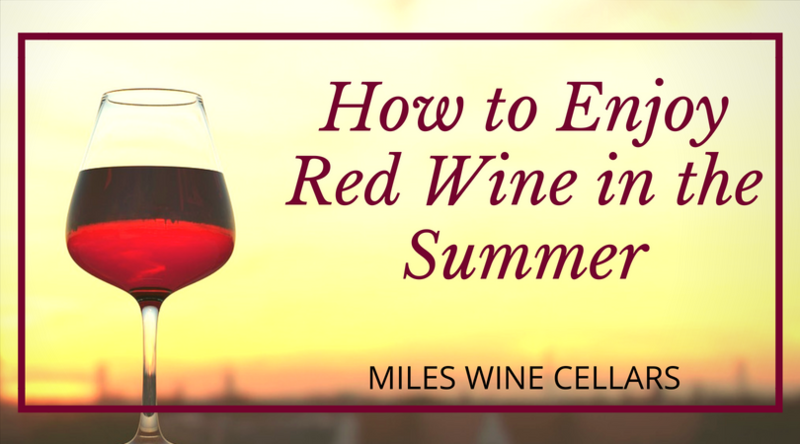 No longer will the parade of summertime whites and rosés keep you from enjoying your favorite red that has the same thirst-quenching elements.